- Date: 03/2012, Seed: undisclosed amount (post valuation: undisclosed amount). START connects 150 of world's leading startups with the world's most active investors and influential media in an intimate setting for 2.5 days. START is by invitation only. Invited guests also get complimentary access to the Web Summit by day, including a premium exhibition stand. 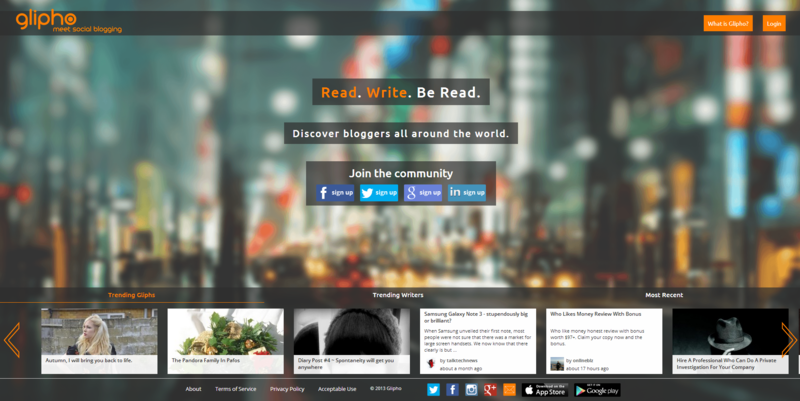 Glipho is a social platform for long-text bloggers who have found it difficult to achieve their desired audience and engagement, or who have been disenchanted by the complexity and isolation of existing blogging platforms. 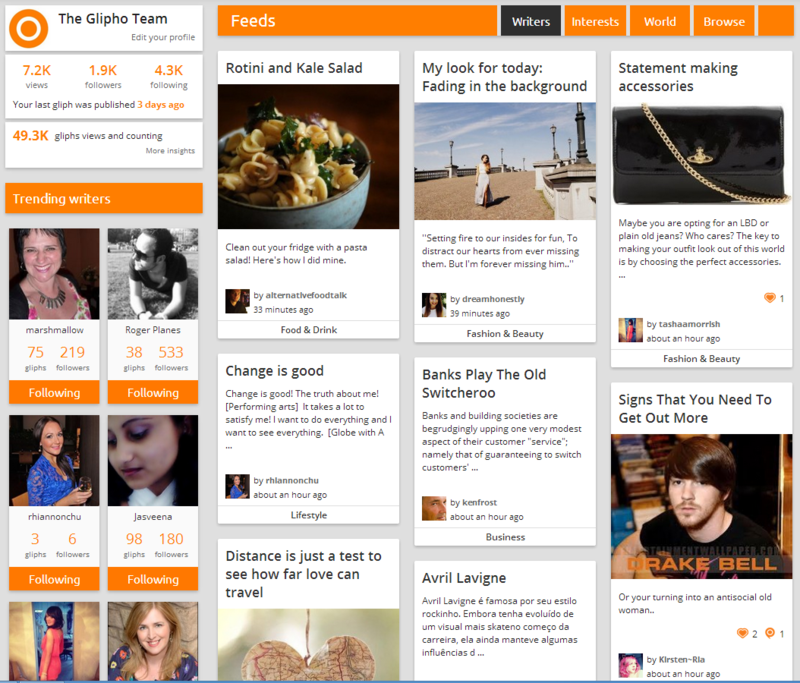 Answering the needs of bloggers in the social age, Glipho offers a user-friendly platform with community-oriented features. 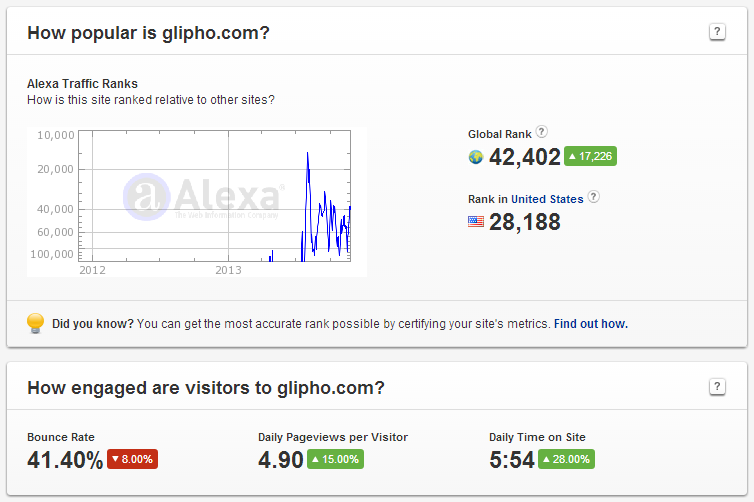 Bloggers find the audience and traction they want thanks to our unique integration of: social connectivity, a simple interface, SEO optimization, and the fact that Glipho is also a content destination. Glipho's concept has been proven by our high levels of engagement and the hundreds of endorsements from press and users across a myriad of blogs and social media sites. Writing on the internet can feel like an incredibly isolated experience despite the fact that billions of people do it every day. Most bloggers struggle to find an audience for their posts and, if they do, need to put nearly as much time into promotion and design as they do into writing. It’s frustrating, disappointing, and lonely. Glipho was created to answer this problem. 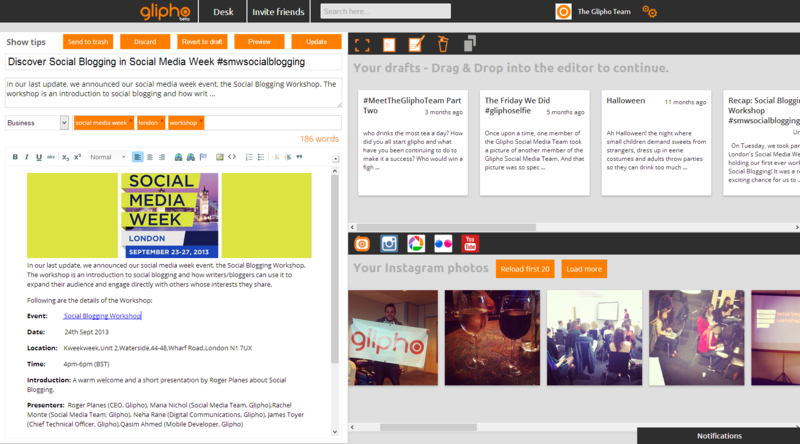 It combines a blogging platform with a social network approach, providing its writers with a built-in audience and easier engagement. So how does it do this? Creation of great content is easy. The desk, with integration into other photo and video sites, enables beautifully annotated articles to be created and published. On publishing, the articles can then be shared to Facebook, LinkedIn and Twitter all at once, at the click of a button. Not only is writing hassle-free, but finding new content to read is easy too. From personally-curated feeds of writers or topics, to viewing anything and everything written on Glipho, you have a range of reading options. Finding out more about writers is as simple as looking at their profile. Here all content they have created, followers, and people they follow can be found. Glipho believes that it should not be an isolated island in the social network world, so any other social networks a writer associates to their profile can be accessed from here. 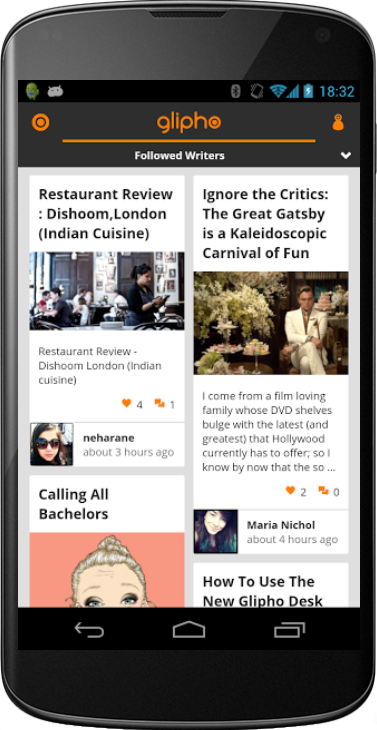 With the release of the Glipho mobile app for Android and iOS users can read and interact with all the content in the platform from their Smartphone. Currently in beta stage, the ability to publish posts directly from the Glipho App will be rolled out in the next few weeks. From Barcelona, I live in London. Built-in audience – Glipho’s social network elements mean that the moment someone publishes their content on the platform, it reaches an audience without any additional action on their part. The platform itself will also promote the content through the Trending Writers and Gliphs features. Increased reach – Glipho is built to make it as easy as possible for writers to raise their online profile and to reach a wider audience and gain increased engagement for their content. 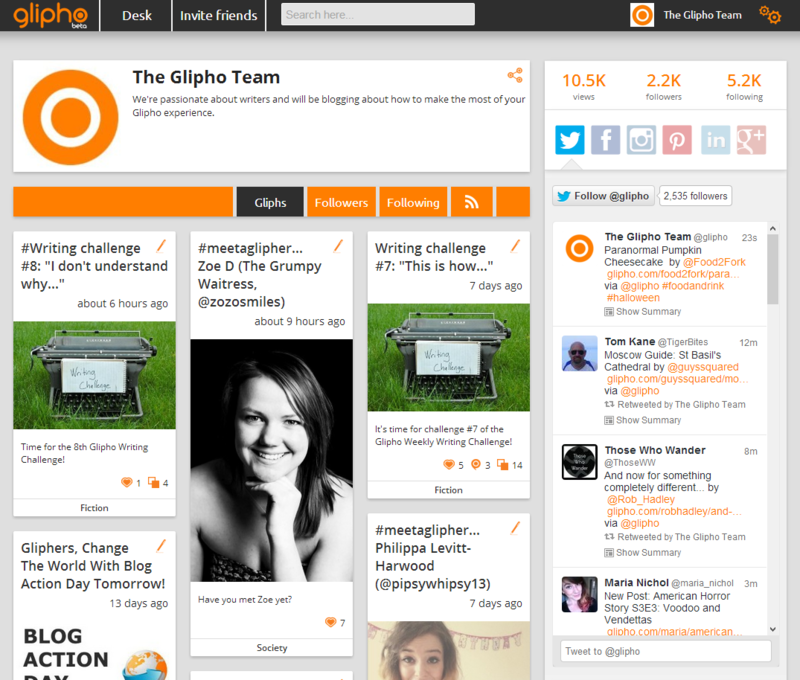 Easy to use – Thanks to our unique interface praised by both press and users, Glipho enables its users to focus on writing and community rather than design and plugins, giving them the opportunity to create excellent content in a distraction-free and rewarding online environment. Community features – Glipho showcases its social network approach in the ability to follow your favourite writers, ‘Like’ your favourite content, and even to write a Reply to another gliph – creating an independent gliph which links back to the original one and appears at the bottom of it. Track industry space – Glipho allows you not only to follow individual users, but to follow specific and unlimited topics as well. This is an invaluable tool for brands, who can follow all related topics for their business in order to track conversations occurring in the industry space their brand occupies. This means they can achieve the speed of response and engagement that is so vital in the Social Age. Glipho was featured in a VatorNews article: "Presenting the 10 finalists for Vator Splash London! "